So today I will not be writing about anything I knitted. Ready? 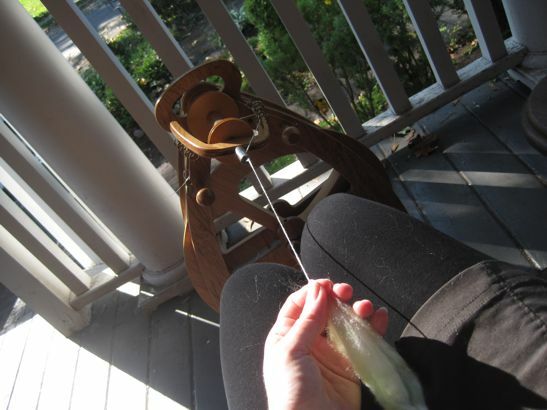 At the beginning of the summer, I was taking my spinning wheel out to the porch every morning for an hour or two, so it made sense for me to bookend the season by doing that in the afternoons over the crazy-warm long weekend we just had. There was just one catch: I'd already taken advantage of the warm and sunny weather we had to put away all the summer furniture and cart the permanent stuff up onto the porch to be out of the worst of the snow come winter. Still. Worth a try, right? Right. And it turns out the permanent furniture is So Much Better for spinning than the summer stuff. Those chairs are just regular patio table chairs with ugly but super squashy cushions on them, so you'd think they'd be ideal. Especially since you're not looking at the pattern when you're sitting on it. But I always had back and shoulder pain after spinning, which did not happen this weekend when leaning back in the old Adirondack/Muskoka style chair. Which looks like this after nearly 15 years of use. Oh dear. I so should have taken the time to restain these again over the summer, though I think the blond areas on that one arm are actual rot. I let the porch go entirely too, and it really needed floor paint. 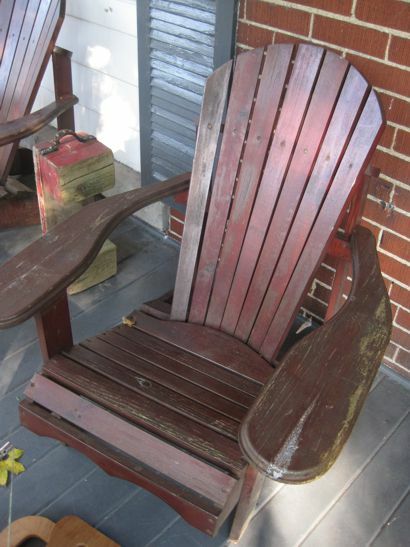 Anyway: new favourite thing, just when the chair is falling apart and the weather is about to turn nasty. GO ME. This is the bamboo/tencel/merino blend I bought from Waterloo Wools at the Kitchener-Waterloo Knitter's Fair. It was tricky to get my wheel set up for the slipperiness of the bamboo, and I seem to have produced still more bulky yarn as a result, but hey! it's even! and it's green, and it's done. There. 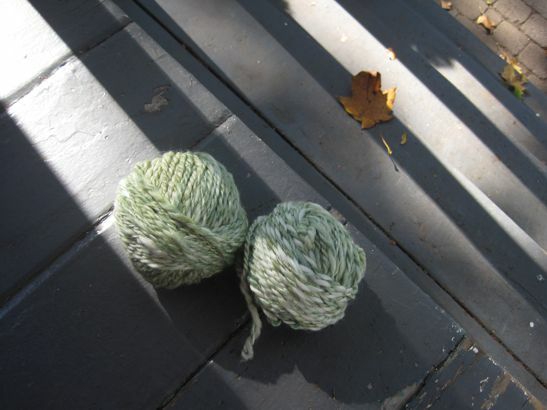 I didn't write about anything I cooked, knitted, or sewed, and the eagle-eyed among you will have noticed I didn't really write so much about spinning either. Nope. I wrote about a CHAIR. Ha!